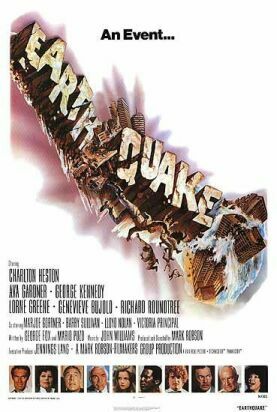 There's a seminal scene in Universal Pictures' Academy Award winning movie Earthquake. An earthquake of unimaginable magnitude devastates Los Angeles. Self made man Stewart Graff (Charleton Heston), his estranged wife Remy Royce-Graff (Ava Gardner), and his girlfriend Denise Marshall (Geneviève Bujold) are trapped in a collapsed underground parking garage. A dam breaks and the parking garage begins to flood rapidly. Climbing a ladder, Denise makes it up to safety away from the flood. Stewart is close behind her on the ladder. Remy is behind him. The flood catches up with Remy threatening to sweep her away. Stewart looks up and sees Denise safe. He looks down and sees Remy about to be swept away by the flood. If he climbs up the ladder, he'll have safety, his girlfriend, and his life. If he climbs down the ladder to save his estranged wife, he'll put himself in grave danger, in fact he may be killed along with her. It's a rough dichotomy he's in: his girlfriend, or his about to drown estranged wife. He has a hard choice to make. And he doesn't have much time to make it. What will he do? What would you do? Stewart is a good, decent man. He has an impossible choice to make. Given the extreme circumstances, he'll be totally committed one way or the other, whichever choice he makes. Said another way, given the extreme circumstances, the circumstances will commit Stewart one way or the other, whichever choice he makes. No one, not even a good, decent man like Stewart, is spared the consequence of choice. I won't spoil the movie for you by revealing Stewart's choice, what happens next, or how things turn out. Rather, I want you to sit, just for a moment, with the space of "rough dichotomy, hard choice" on your lap like a hot brick. I want you to look at what you would draw on if you, like Stewart, must make a choice in a dichotomy as rough as his. In a rough dichotomy when faced with a hard choice, consider a good source to draw on is integrity. In all likelihood, there the choice is already made. By looking to integrity, you're likely to see an opportunity to choose what's already so. An already made choice ie choosing what's already so when standing in integrity can be an ordeal by fire. In the face of choosing what's already so ie the already made choice standing in integrity, what's there to confront is the plethora of out of integrity choices made before that instant in time, all the out of integrity moments leading to and shaping the current situation. The restoration of integrity, by already made choice alone, isn't easy. If it were, the whole world would be in integrity by now. Letting go, >all at once, of all out of integrity choices (as well as all their outcomes and all their ill gotten gains) leading to and shaping the current situation, isn't for the faint hearted. It's brutal. In a rough dichotomy when faced with a hard choice, stand in integrity, look ... then choose what's already so. That starts an entirely new future based on integrity with an entirely new set of possibilities.